I have been insanely busy with life and Sedona Lace and school is starting tomorrow so I haven't been able to do ANYTHING! Check it out if you love Hello Kitty! 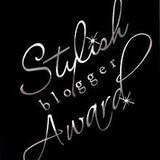 I was honored to have been awarded "The Stylish Blogger Award". 1) I LOVE food. I love any type of food, but Japanese is my ultimate favorite. If I could I would eat it EVERY SINGLE day of my life and I probably wouldn't get tired of it either. 2) I love anything that has pearls or roses as ingredients in them. 3) Absolutely an animal lover! 6) I hate putting lotion on my body. I have no idea why I don't like putting the actual lotion on, but I love to buy lotion because they smell good. 7) Lastly, I sing in the car and in the shower. Its like there is an automatic switch in me and whenever I get in the car or shower I start singing.